From Newbery Medalist Avi comes the thrilling and suspenseful story of an ordinary American family who falls under suspicion during the 1950s Red Scare. It’s 1951, and twelve-year-old Pete Collison is a regular kid who loves detective stories and radio crime dramas. When an FBI agent shows up at Pete’s doorstep, accusing Pete’s father of being a Communist, Pete is caught in a real-life mystery. Could there really be Commies in his family? Avi is the author of the Newbery Medal novel Crispin: The Cross of Lead and the Newbery Honor books Nothing But the Truth and The True Confessions of Charlotte Doyle, among many other books for young readers. 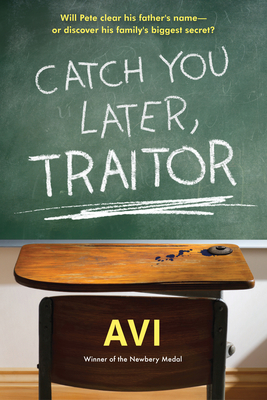 Catch You Later, Traitor was inspired by his own childhood in Brooklyn during the Red Scare. Avi now lives in Colorado. You can visit him online at www.avi-writer.com.